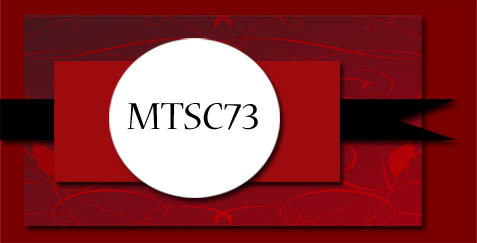 These cards are for FTL 92. 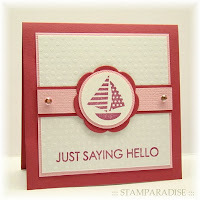 As soon as I saw this sketch, I thought about a yacht image for the focal panel and wanted to make a small sized card. But the yacht stamp which was in my stamp collection was too big. So I had to start with carving a new yacht stamp. Each card was measured to 3.5" ×3.5". Usually I prefer dull, dark or pale colors, and don't use bright or brilliant colors as a main color on my creations. So the yellow one and the pink one were really challenge for me. I like how they turned out, though I'm not sure that I will use these colors as a main color again. lol! 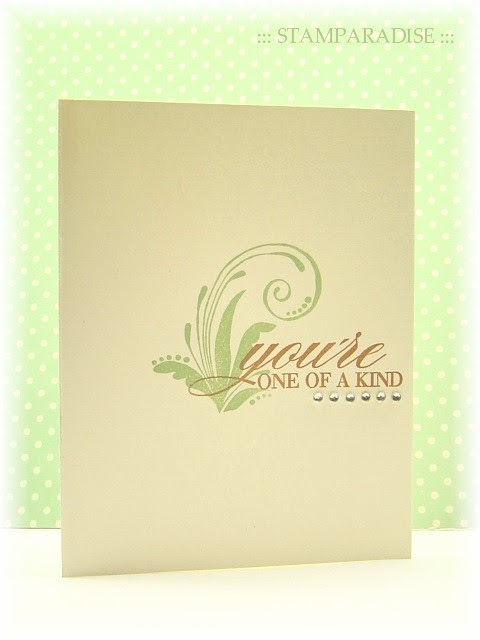 This weeks challenge over the CAS-tastic Wednesday Challenge (CWC005) is to use a touch of green. And the One-Layer Wednesday Challenge 6 (OLW 6) is requiring us to overlap a sentiment and an image. Here is my take. I grabbed out my flourish stamp which had been neglected for a long time, and stamped it directly onto card base with Aloe Vera ink (Versa Magic) . 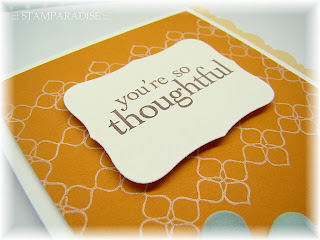 The sentiment was stamped with Gingerbread ink (Versa Magic). 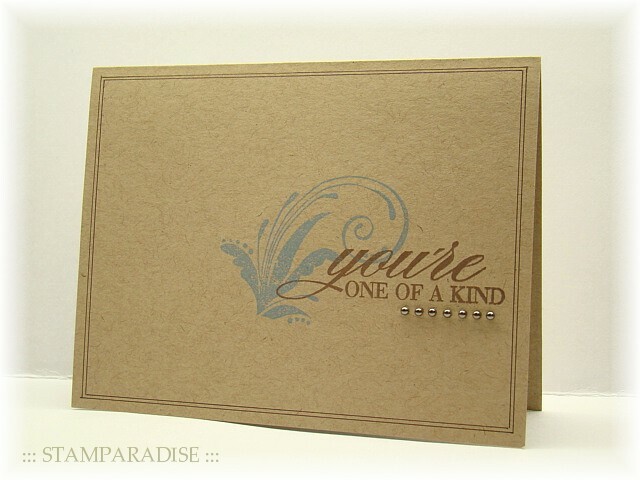 Several rhinestones were added to finish the card. Super quick card! LOL! 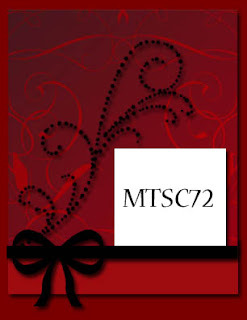 I made one more card for OLW 6. I used the same stamps, but used kraft cardstock as a card base. I added tiny pewter pearls for embellishment, and drew some double lines with a brown gel pen. 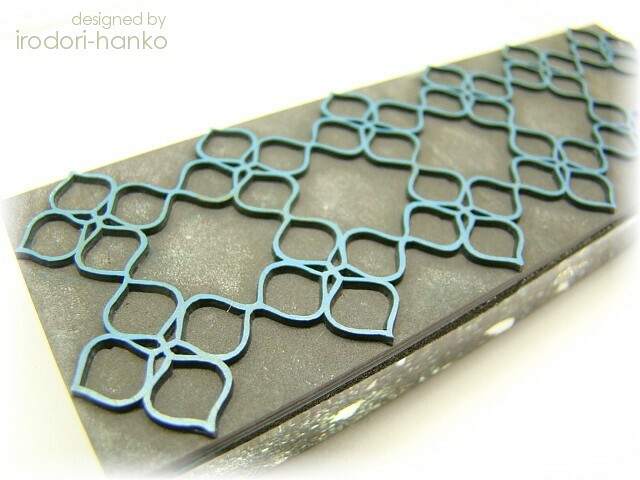 This card is for Card Patterns Sketch 65. I know that you don't call this card CAS. LOL! 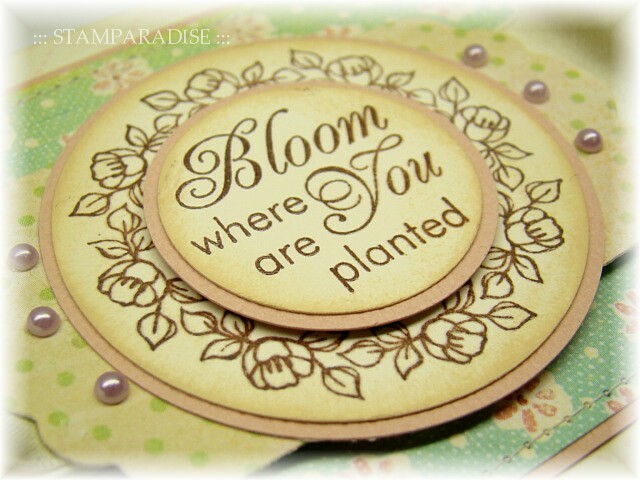 But I love this clematis stamp which I carved last summer, and I'm satisfied with the end result any way. Today is my last day as a Guest Muse on Mercy's Tuesday Sketch Challenge. I've truly enjoyed working with Mercy and her Muses this month! Thank you so much for giving me such a wonderful oppotunity, Mercy! 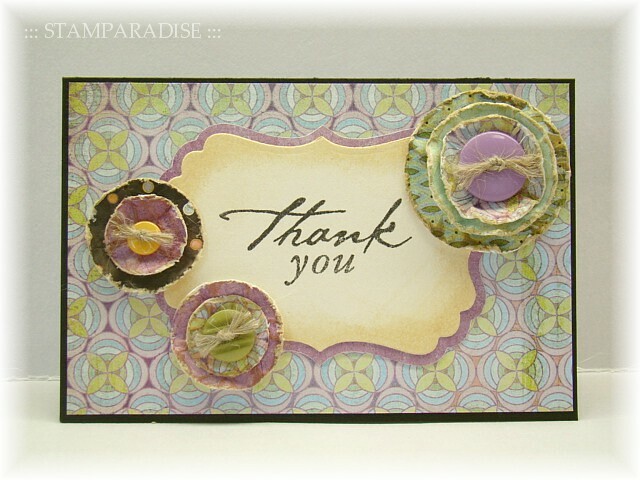 Thank you to all Muses for a warm support! And thank you to readers for leaving a lot of lovely comments. I've greatly appericiated all and each of them. 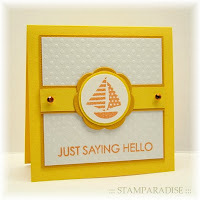 Now, let's go on to this weeks sketch and my sample card. 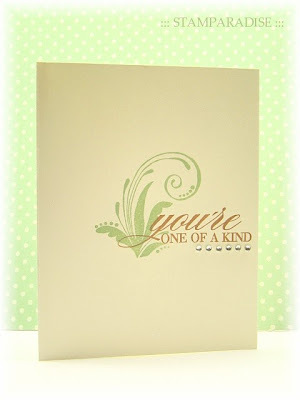 I created my own patterned paper using my new background stamp for the upper part of the sketch. 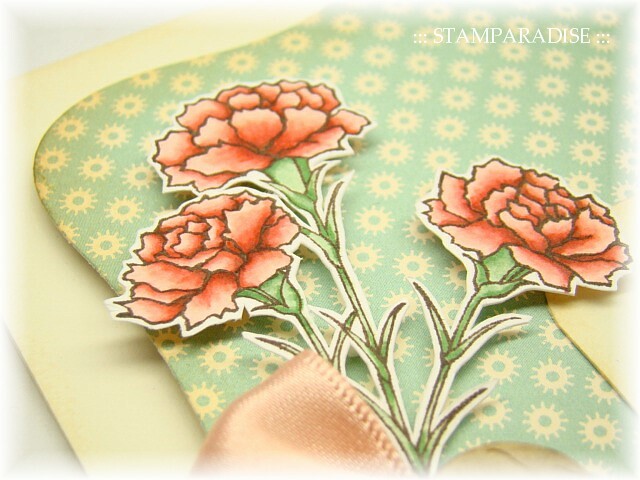 So sorry, I forgot to take a picture of the stamp I used, but a close up photo of the patterned paper is shown below. 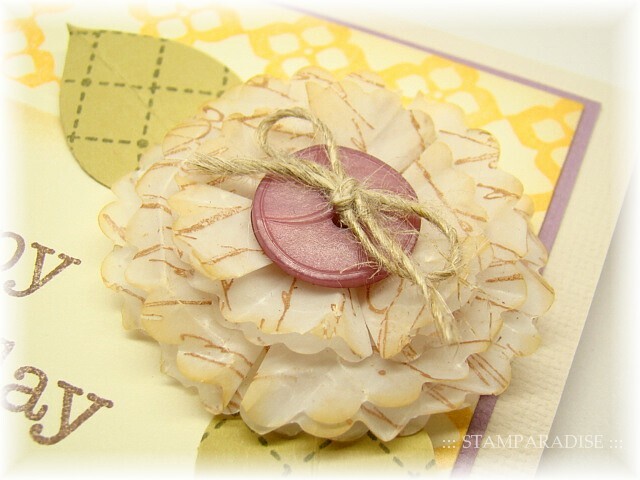 The flower was made of vellum paper. 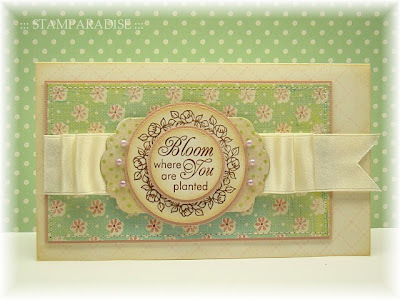 I followed this fabulous tutorial by Betsy Veldman to make it. 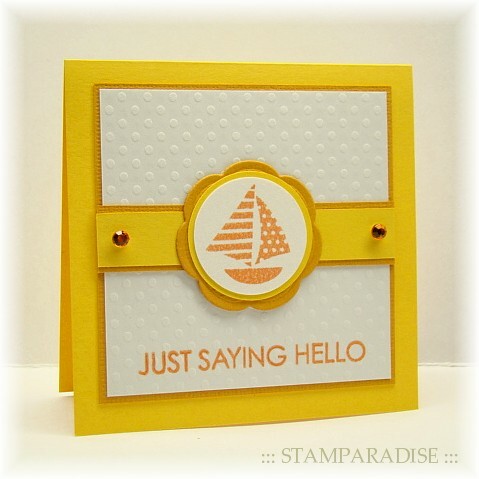 I stamped a script stamp onto vellum paper and cut with Spellbinder's Scalloped Circle Nestabilities. I folded each flowers to make petals and layered them. And then, I distressed the petals with Antique Linen ink (Distress ink) and added a button. 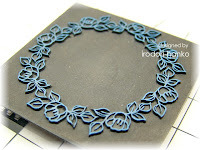 The leaves were cut out by scissors from a scrap of stamped cardstock. 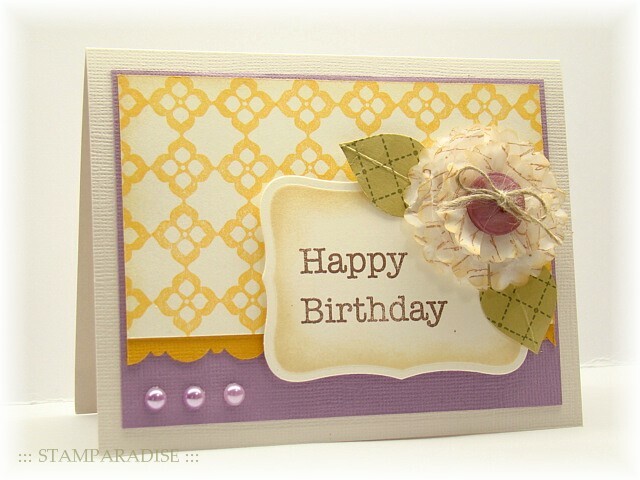 A couple of pearls were added to complete the card. That's it from me today! Be sure to visit Mercy and her Muses, and see what they have created with this weeks sketch. 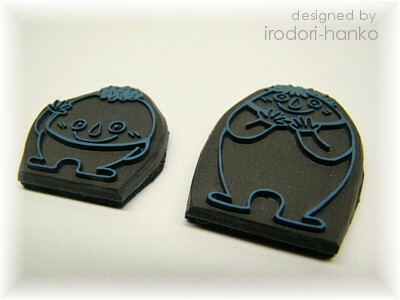 Today I'm sharing my new background stamp which was completed a couple of days ago. 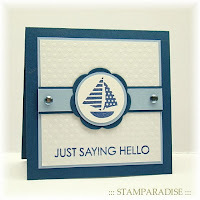 And here is a card I came up with using this stamp. Thank you for stopping by! Have a wonderful weekend. Hello everyone ~ ! It's time for Mercy's Tuesday Sketch Challenge 74! 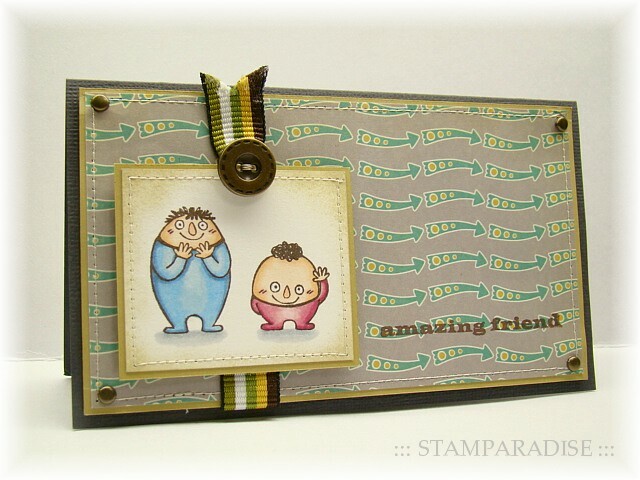 After I made this card last week, I was in the mood to create some stamps of funny images. I drew a lot of monsters and showed it to my children. And I asked them to pick out some monsters they like. But they said, " There is no monster we like." WHAT??? Guess how disappointed I was!! LOL! I understood that they love Pokemon, but don't like the monsters I drew. 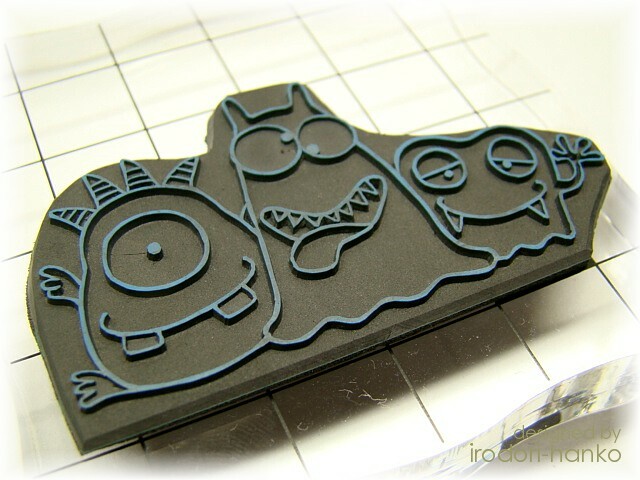 :( Therefore, I decided to pick out my favorite monsters, and to make them into a stamp. And this weeks Mercy's sketch and my sample card. 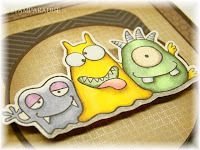 How do you think about my monsters? I wish some of you liked them... lol! 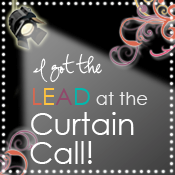 I got "The Lead" !! Happy Monday everyone. 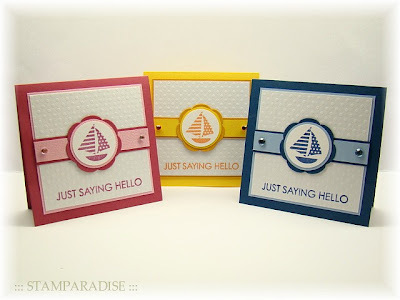 I have no card to share yet, but I just pop in to share an exciting news! 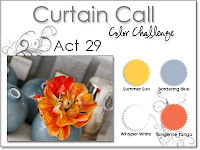 My card was honored to be chosen as "The Lead" at the Curtain Call Color Challenge : Act 29! Can you guess how excited I was? LOL! 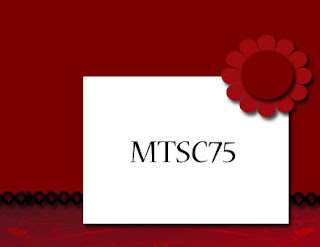 Thank you so much for choosing my card, Stacey. I truly appreciate it! I made this card just for fun. 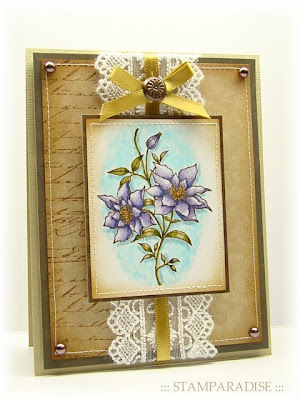 And I tried two new techniques on this card - Dimensional flower and ruffled ribbon. When I saw Maki's this beautiful card, I knew that I have to try to make a dimensional flower by myself. But I have neither the die she used nor the die used in the tutorials she introduced, so I used the Bloosom Nestabilities (Spellbinders). The stitched grosgrain ribbon was sewed and ruffled. I'm not happy with the how it turned out... :( I would like to try again! 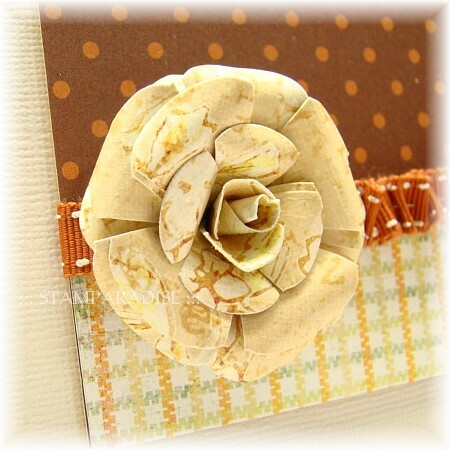 I will add more texture to a dimensional flower, and make ruffled ribbon with wider ribbon. 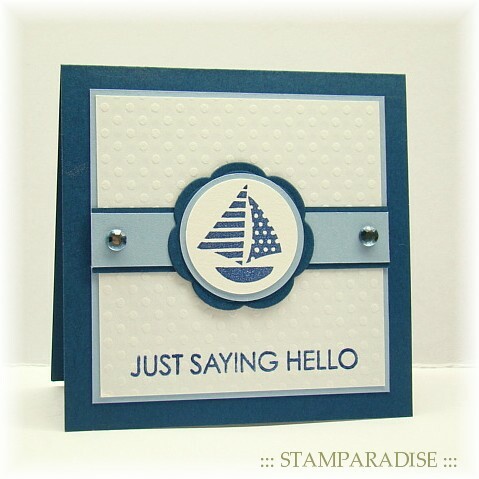 Here is a card I made using those stamps. 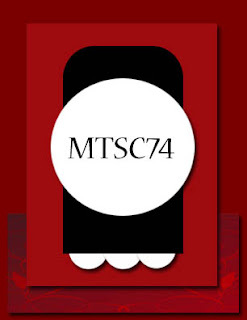 This card was based on the sketch from this weeks Card Positioning Systems, CPS 166. I rotated it 90 degree. Maybe the big arrow on the sketch reminded me of this Cosmo Cricket's paper. lol! The funny boys were stamped with Espresso (Versa Craft) and colored with Copic Markers. The edges of the focal panel were sponged with Old Paper (Distress Ink). I did stitching, and added some metal brads, some striped ribbon, and a button for embellishment. Happy Tuesday! It's time for Mercy's Tuesday Sketch Challenge!! 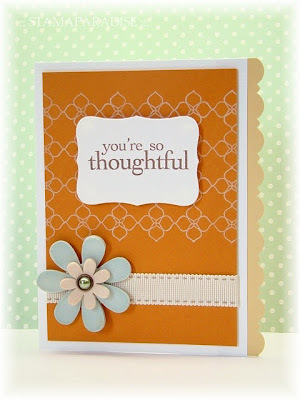 Here is this weeks sketch and my sample card as a Guest Muse. 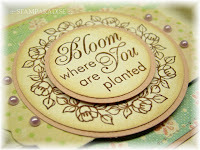 I carved the floral frame stamp which fits the Seeds of Kindness Borders & Centers Set (JustRite). Of course I know that this set contains beautiful borders, but I just wanted to try to create my own frame stamp. I stamped the frame and the sentiment with Espresso (Versa Craft) and heat embossed with clear EP. The edges of the circle panels were sponged with Antique Linen (Distress Ink). I used one of the Label 11 Nestabilities for the smaller rectangle panel on the sketch. Oops! I almost forgot it... 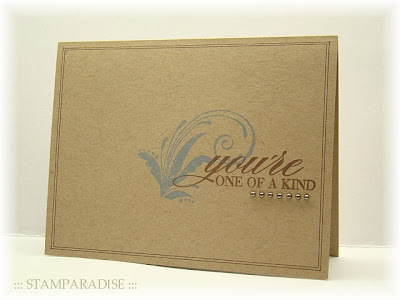 I stamped a background stamp (I carved too) directly onto the card base with Pixie Dust (Versa Magic), though it is hardly to see on the photo. 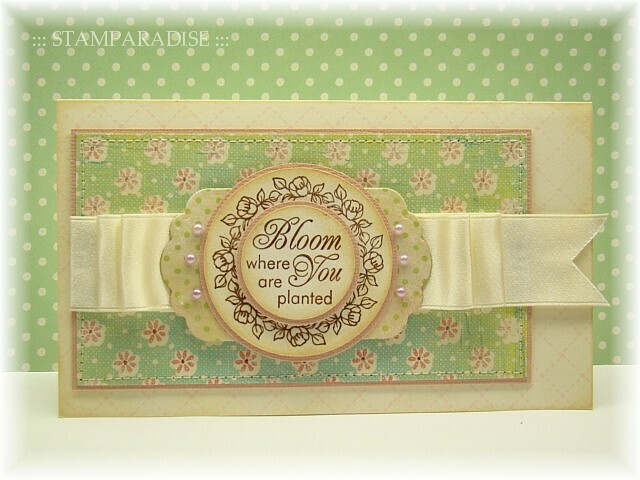 I added some white satin ribbon and tiny pearls to complete the card. Hello everyone! 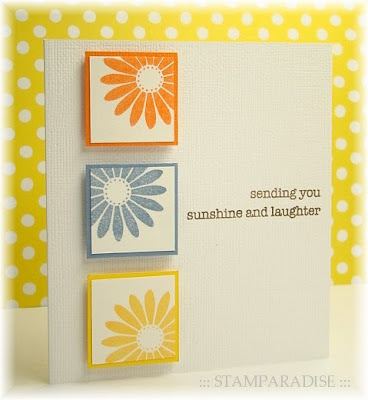 Today I have a CAS card to share with you. 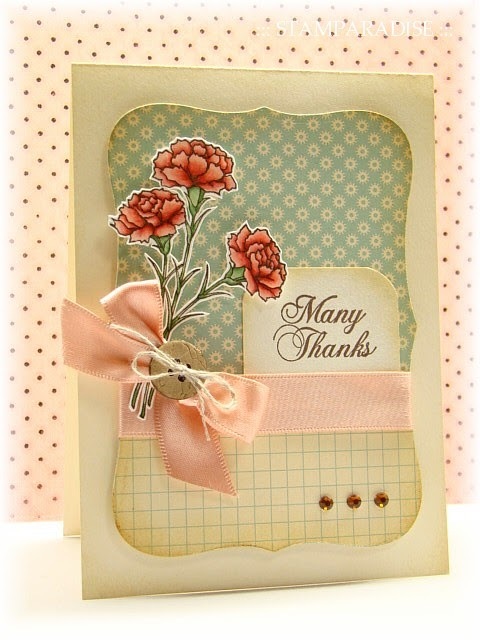 I'll be back tomorrow to show you a sample card for the Mercy's Tuesday Sketch Challenge. Until then! I went to the 34th Japan Hobby Show yesterday. I was so excited and purchased a bunch of stuff - papers, buttons, ribbons, ink pads and nestie dies. Of course I couldn't help playing with some of those today! lol! 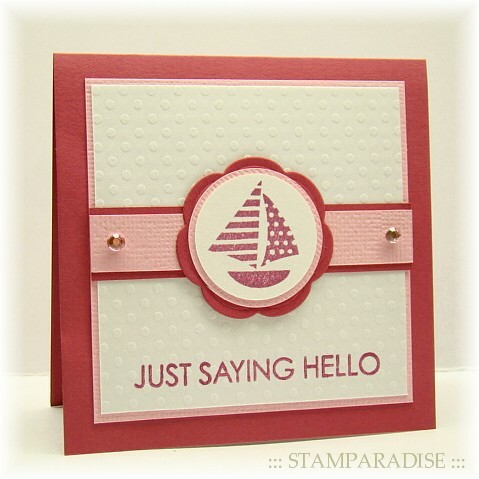 This card was used the current sketch from Clean and Simple Stamping (FTL 89). The card size is 3×4 1/2. For the focal panel, I used a nestie die I purchased yesterday. It is from Wonder House. I had never heard the name of this company, but I loved this nestie die as soon as I saw. 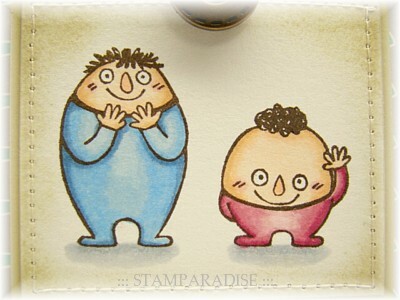 The papers I used on this card are Kioshi 6×6 paper pad (by Basic Grey). I LOVE soft and shabby feel they have. MTSC 72 --- Guest Muse! Hello everyone. 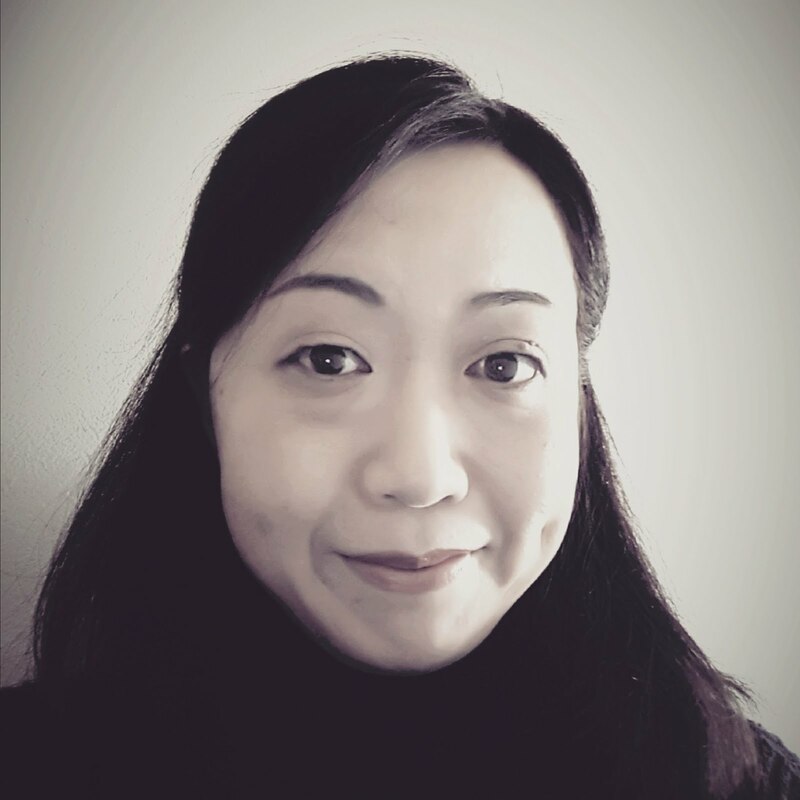 I'm in my husband's parental house with my family now, but I pop in to share with you an exciting news! 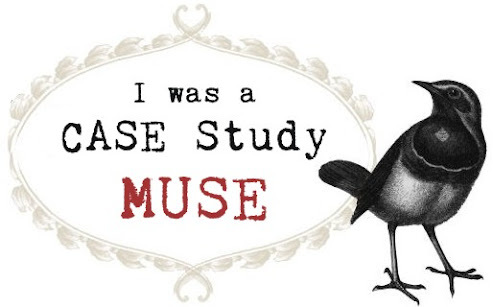 I'm a Guest Muse for May over Mercy's Tuesday Sketch Challenge!!! I'm so proud of it and am so excited to work with Mercy and her talented Muses this month. Here is this weeks sketch, MTSC 72. 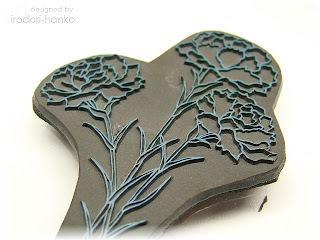 I wanted to make a Mother's Day card with this sketch, so I started with carving a carnation stamp. Here are the stamp I've carved and my take on the sketch. 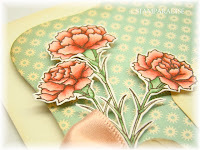 I used the carnations instead of the flourish on the sketch. I stamped it with Espresso ink (Versa Craft) and colored it with Copic markers. 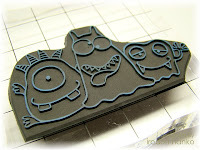 I cut it out carefully with a pair of scissors and a craft knife, and adhered with pop dots. All edges of the focal panel and card base were sponged with Antique Linen ink (Distress ink) to get a vintage look. 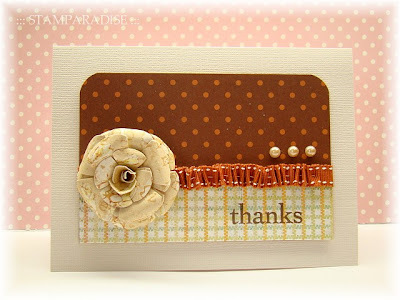 I added some satin ribbon, a bow, a wood button and a couple of tiny rhinestones to finish the card. Be sure to visit Mercy and her Muses, and see what they have created with the sketch! I'm sure that they are full of inspiration.